NEPAL is a nation which stands for Never Ends Peace and love. our ten heritage are enlisted in the world heritages sites which is an evidence to the world to evince Nepal is the country with incredible heritages and monuments among which DOLAKHA BHIMESHWOR is also, one of the noted throughout the country and outside the country . it is a monument with typical history and miraculous art as wells as sculpture which is summarized below. IT is situated at the east of the Charikot at the distance of 4.5 kilometer. It is a one stored temple without roof, in front of this temple there are four pillars of stone. Bells are present in all the side among which biggest lies in front which produces loud sound. There is written script in the white stone and various minor statues on the left side. A mechanical machine is kept on right side so that coconut can be broken with the machine. Wood made windows consisting prodigious carving are kept. People usually worship the god on Saturday and Tuesday on these days some animals are also sacrificed. In the morning newars sings their religious songs (Bhajan) everyday. Snacking photo is permitted outside but strictly prohibited inside the temple but the special provision of the member and priest of the temple we have get chance of snacking a photo of God Bhim. 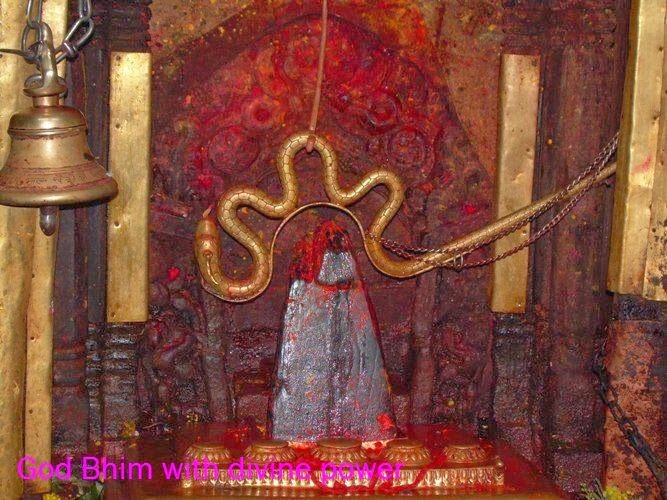 There is a big stone in front of the temple in pillar structure which people believed its dipped part inside the surface is more than the part above the land .The miraculous thing is that the statue of Dolakha is sweating time to time .One of the faith of people is whenever any incidents are going to prevail either in present or future Bhimeshwor himself tries to protect his people by warning them through the sweat. Anciently before the roof of the temple was constructed which was found destroyed in the next morning of construction. Again people constructed but same happened though which people realized the god dislikes roof so it is lacking the roof. The sculpture done in window and door of this temple is absolutely pristine. It is the temple having faith of numerous people and also symbol of unity, pride and identity. Our culture, religion, festival are materialized and promoted by this monument. When the morning start with ringing bell of this temple, the day become auspicious. 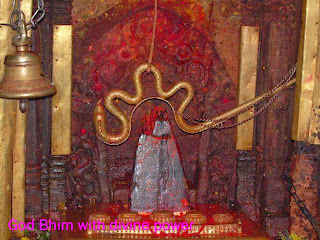 Festivals like Shivaratri, teej including other are highly celebrated with great mirth in this temple. Despite its ancient establishment it is lured, attractive and not in the position of destroying. Dolakha Bhimeshwor is identity, glory, and dignity of Nepal. We all know if identity is lost once it neither can be healed nor can be bought. All of us pour gesture of gratitude to ancestor because of gifting such majestic asset. We are fortunate that Dolakha Bhimeshwor is with us and we should make our coming generation also fortunate by keeping it up to the mark. We may die but shouldn't let it to decrease its attribute. Promoting and preventing it is promoting culture and welcoming foreign guests thus it is a plea to all the people to have join effort and make it eternal.